The equestrian program at Rockbrook is well known for its quality horses and riding instructors. Girls enjoy equestrian activities every day, riding and improving their equine knowledge while taking advantage of the fun environment of the entire camp. 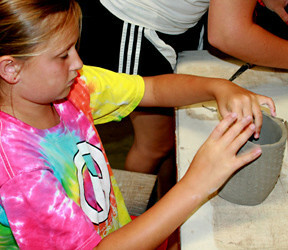 Throughout the summer, the Rockbrook equestrian camps teach girls of all ages and riding abilities. Beginners learn to walk their horse, while others advance to trotting, cantering and jumping. There are camp horses perfectly suited to match this range of riding equestrian skills. 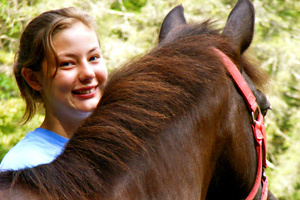 What is the best thing about horseback riding at camp? It’s hard to say of course, but a lot of it boils down to what you see in this photo. 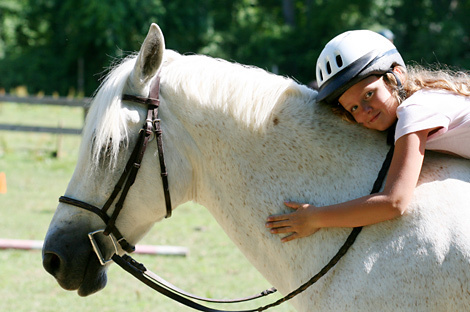 While it’s certainly important for an equestrian camp program to have excellent instructors, well-trained horses, and great riding facilities, how our riders feel while riding is what they’ll always remember. When a horse and rider really “click” (something the Rockbrook equestrian staff works hard to achieve for the girls) and suddenly they’re riding smoothly and naturally, there’s often this unique combined feeling of surprise, wonder and delight. It’s almost magical, and something really special to see as the girls burst into this kind of smile. Fantastic! 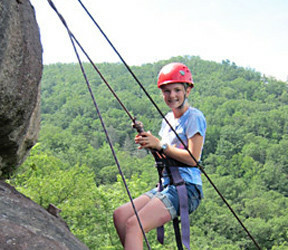 Around this time year, with last summer pretty far behind us and next summer’s camp fun still several months away, it’s easy to start missing all the great stuff we love about Rockbrook. 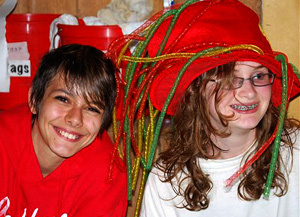 Of course, you can bounce all over the RBC Web site and check in with your cabin mates in the Friends Net, enjoy some camp activities at home, or even watch some videos. You can look forward to a holiday surprise coming in the mail (hint: CP). You can pull out your journal or letters you received last summer. 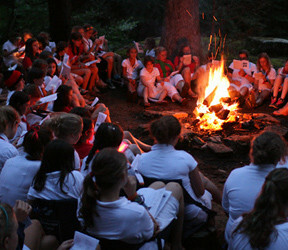 There are ways to relive bits and pieces of camp, even now as we head into winter. But what if you love horses, and you aren’t able to ride much while at home? 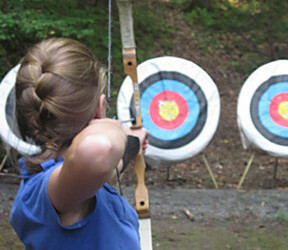 After riding at camp, what can you do to feed your desire to ride and learn about horseback riding the rest of the year? Fortunately, there are a ton of excellent resources available on the Internet, different Web sites dedicated to all things equestrian. Here are few great examples. Let’s say you want to just learn some surprising facts about horseback riding. Just head over to Equine Kingdom and dig in! Did you know that the oldest horse on record lived to be 62 years old, or that there are about 75 million horses in the world?! This is a great site with fun photos, videos, articles, quizzes and more. You’ll be able to spend a lot of time enjoying Equine Kingdom. If you would like to learn about all of the equine resources available in your area, a farrier, boarding farm, or veterinarian for example, you can head over to Newhorse.com or Forequestrians.com. These are two directories, organized collections of other Web sites related to horseback riding, horses and their care, horses for sale, riding games, and more. You can think of these as jumping off points for finding out even more. So don’t let your interest in horseback riding fade over the winter! We love riding too much for that! 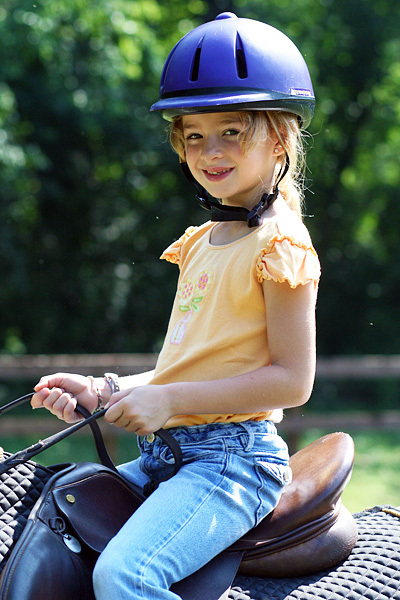 For little girls, taking their first equestrian lesson can be a mix of excitement and nervous jitters. It’s exciting because horseback riding seems so fun when you read about it or see it in movies, but for your first riding lesson, it can easily be a little overwhelming. There is so much to learn— special clothes, important safety rules, riding gear for the horse, how to mount, different riding positions, and communicating with your horse. The horses and ponies can seem so huge! And there is a lot to remember all at once. That’s why it’s so important that a girl’s first experience learning to horseback ride be a safe, caring, gentle introduction. It’s crucial that her instructor be experienced working with small children, that he or she be kind and patient, and that the pony be calm and gentle in the ring. Taking small steps, gradually gaining confidence and greater understanding, is the best way to maintain a girl’s enthusiasm for riding. The best children’s horseback riding centers know how to pace this kind of progression. 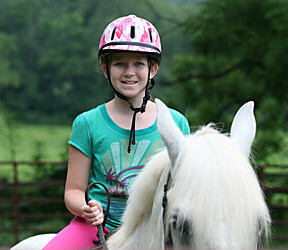 The equestrian program at Rockbrook Camp has a long history of introducing young girls to horseback riding. 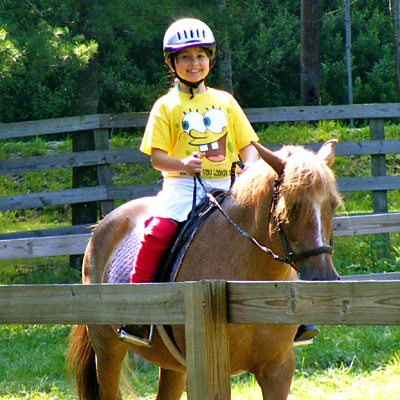 Camp has just the right combination of skilled instructors and gentle ponies, enthusiasm for riding, and great equestrian facilities to encourage girls on their very first ride. 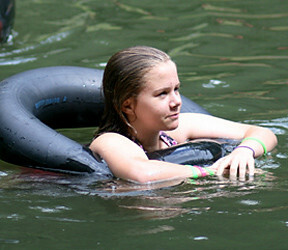 At camp, we’re well prepared to make every girl’s first horseback riding experience a positive one. It’s the perfect recipe for a life-long love of horses and horseback riding! Visiting the equestrian center these days is a real treat. It’s just alive with big action and big smiles. The girls who selected riding as one of their activities are now well settled into the daily lessons. They know how to get dressed properly (helmet, boots, etc. ), in most cases, how to lead their assigned horse out to one of the riding rings, and even how to mount. The riding staff is doing a wonderful job in the mounted lessons keeping each camper engaged and excited. As the session progresses, it’s neat to see how much everyone’s confidence and skill has improved. It’s also fun to hear the campers talk about their favorite horse at camp, someone they’ve ridden a lot and gotten comfortable with. Maybe you’ve already received a letter from your daughter and heard about one of the great horses she’s been able to ride. Learning to communicate with a special horse, and learning to trust him or her, is one of the most rewarding parts of horseback riding, and it’s happening just about every day around here. 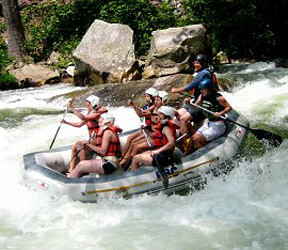 Also, today was a big day for whitewater rafting on the Nantahala river. We took all the middlers and seniors who wanted to go on either an overnight camping/rafting trip or on a day trip down the river. 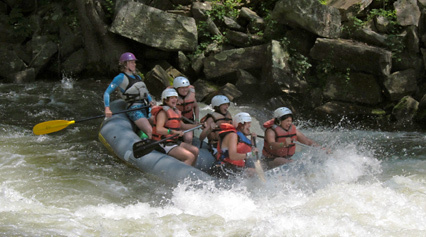 The Nantahala is famous for being rather chilly (somewhere near 50 degrees) even in the heat of the summer, so we were lucky to have bright sunny weather for both trips. 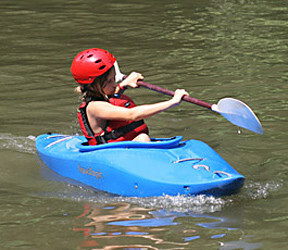 Great weather like this makes it much more fun to splash and play while rafting, even at times jumping in on purpose when the guides say it’s OK. Rockbrook is the only girls camp with a permit to raft the Nantahala (we’ve had it since the 1980s), so we also can hire our own seasoned raft guides. On this trip Clyde, Sid, Billy, Leland, Michelle and and Andria guided the boats, making up a team with more than 85 years of combined whitewater experience! These folks truly are the best. Rafting trips are always very exciting for the girls, and also pretty tiring, so it was no surprise to see most everyone conk out in the bus on the ride back to camp. This kind of adventure and fun needs some rest too! Back at camp in time for dinner, there was a big surprise waiting. Birthday Night! This is a special dinner where the dining hall is rearranged so that everyone can sit according to their birth month… twelve big tables, one for each month. It’s really fun for campers and counselors to sit together and get to know better other girls from different cabins and age groups. 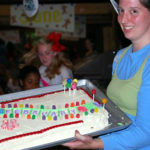 This time, to give it a even more Rockbrook flair, we had a theme for the dinner: Candyland. 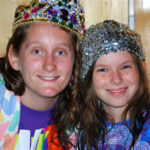 And never missing a chance to dress up, this sparked some very creative costumes from the counselors and campers. They dressed as different types of candy and characters from the Candyland board game. In addition to lollipops and gumdrops, we saw the Duke of Swirl, Mr. Mint and Gramma Nutt. Even Sarah dressed up as a Hershey’s chocolate kiss with almonds! 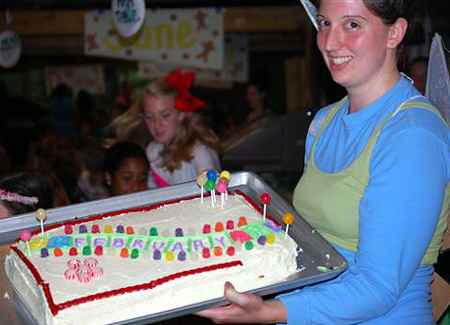 The highlight of the night though was the cakes, the homemade cakes Alison baked for each month that she then decorated as scenes from Candyland. They were both beautiful and delicious. There were some pretty huge pieces of cake for the girls in some months. Yum! Any day now, more of our horses will be arriving at camp. We’ve been getting ready too! New fences and gates are up, the fields are lush and green, and the new equestrian office is set. We’re positive sitting on that porch will be very popular. 🙂 There will be plenty of action with both camp barns full and 28 horses in all. Many of your favorites are coming back— Danny, Lacy, Buddy, and Cool Beans —and there will be a few new equestrian surprises as well. Are you ready to ride? It’s going to be great! And fun! 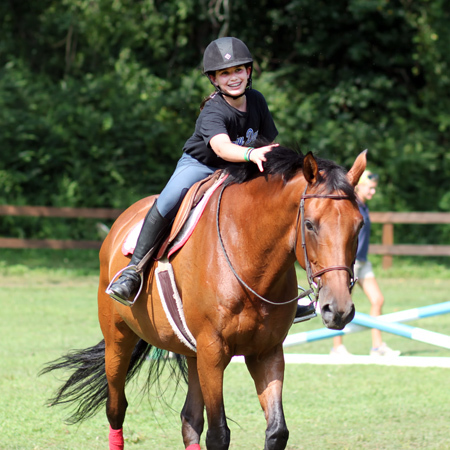 If you’re a horse kid, an equestrienne (a girl who loves all things horse related), then you will love the equestrian camp programs at Rockbrook. You’ll of course learn a lot about riding and improve your horseback skills, but you’ll also gain important equestrian confidence. This photo shows a little of that. It’s a great shot of what it feels like to be comfortable in the saddle, to really know and trust your horse, and to build up a set of instincts about horseback riding. The secret to all of this is not just great horses and great riding instructors; it’s also making the equestrian lessons fun for kids. With the right match of horse and rider and the right level of instruction, you feel good in the activity, not worried about anything and certainly not bored either. 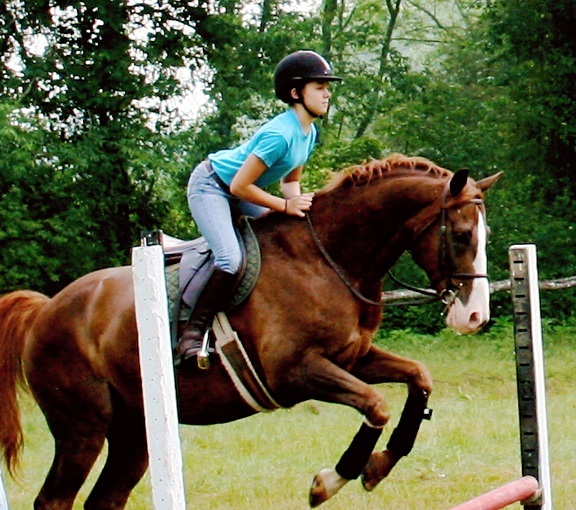 At Rockbrook, we’re riding, and learning, and becoming more confident equestriennes, and having tons of fun doing it. Rockbrook has recently been added to the “all things horse” web site infohorse.com. With information and articles about horse care, horse breeds, horse careers, horse training, and of course horse camps, it is a fantastic Internet resource. Since 1997, infohorse.com has been a great place for every horse enthusiast to find out about horse related products and services. Rockbrook is proud to now be included. Our equestrian program has a very nice detailed profile on the site. 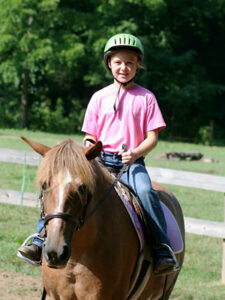 Want to learn more about horses and horseback riding? Head on over to infohorse.com! 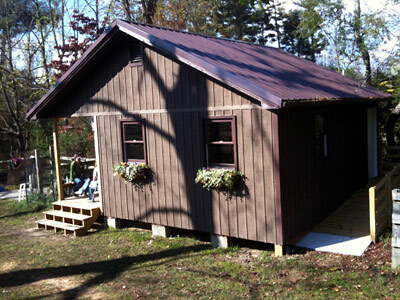 Even though it’s not completely finished, we wanted to share the news about the Rockbrook Equestrian Office renovation. In anticipation of Free Rein’s arrival, and in particular their need for a winterized office building, we decided to upgrade the building. As you can see, it turned out great! 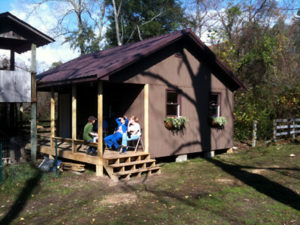 There’s a new bathroom, large meeting room, and a really cool front porch to hang out on. With real heat, windows and fresh paint, it’s a wonderful new addition to Rockbrook’s equestrian facilities. We can’t wait for you to enjoy it next summer! 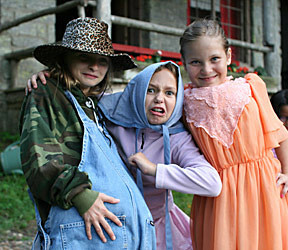 Down at the Rockbrook Stables, there’s lots of action these days, even now after camp. That’s because Brevard’s Free Rein Therapeutic Riding Program has begun operating its equestrian programs there. Free Rein is a nonprofit organization dedicated to encouraging human-horse connections for educational and therapeutic benefits. 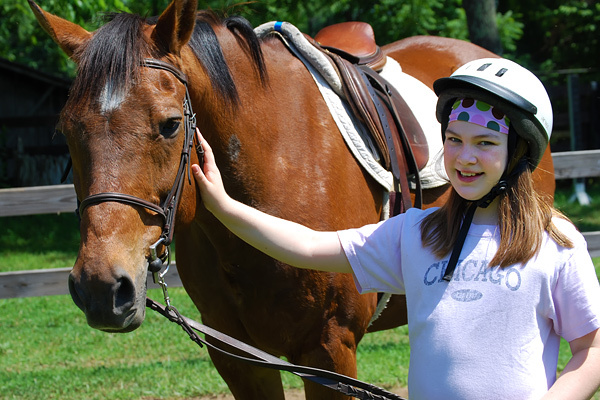 Children, teenagers and adults with a wide range of disabilities make tremendous physical and emotional strides through riding and caring for horses, through having gentle, trusting relationships with such large, powerful animals. For many, these are life-changing effects! Free Rein is a member of the North American Riding for the Handicapped Association and its teachers are NARHA certified instructors. There are over 800 accredited equestrian centers like Free Rein around the world promoting equine-assisted activities and therapies, and serving individuals with special needs. 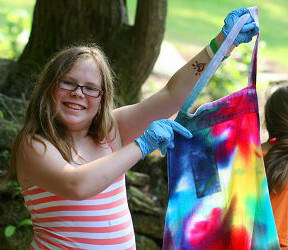 Free Rein will operate its programs at the Rockbrook Stables during the school year allowing camp to run its equestrian programs during the summer. Want to learn more about Free Rein? Visit their site! 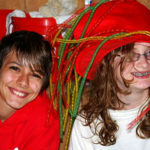 For horse crazy girls, overnight equestrian camps really are the best way to enjoy riding with friends and to quickly improve their riding skills. 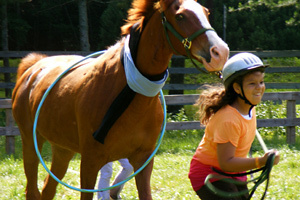 If you take riding lessons at home, coming to camp for a few weeks lets you learn from new instructors. This can be really helpful because you’ll receive different coaching and probably learn something you’ve never even heard before. Also, the horses at equestrian camps are excellent. 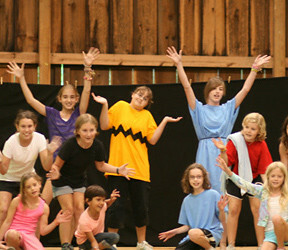 Rockbrook’s horses are schooled throughout the year, and have many years experience working with camp kids. 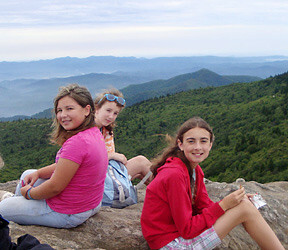 And because Rockbrook is an overnight camp, its equestrian camps give you even more opportunity to be with the horses. There’s always extra time to help with feeding and other barn chores. 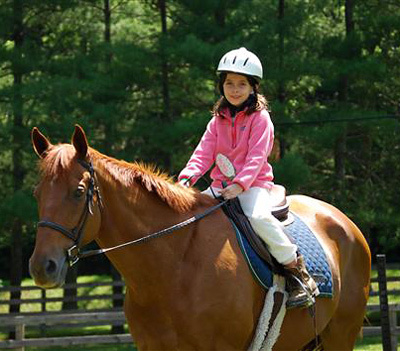 If you’re a complete beginner or an advanced rider, you’ll love the fun of Rockbrook’s equestrian program, but also be surprised how much you learn as well.